To coincide with the 100th anniversary of Ireland's Independence, we have decided to mark the occasion by running a series of workshops which define our Irish heritage and culture. 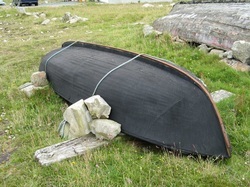 Recently we were kindly given a very old Tory Currach by a local man. This currach is in need of repair and possibly is too far gone to save but it is good enough to use as a template for building a new identical Tory Currach. We would like to offer these work shops 'as Gaeilge' for those of us who would like to brush up on our Gaeilge, to use our cúpla focal and become more confident with the Irish. The emphasis on this project is more on conversational Irish rather than the completion of the currach. So ....anyone interested in making a Tory Cuurach 'as Gaeilge'? We would love to hear from you!